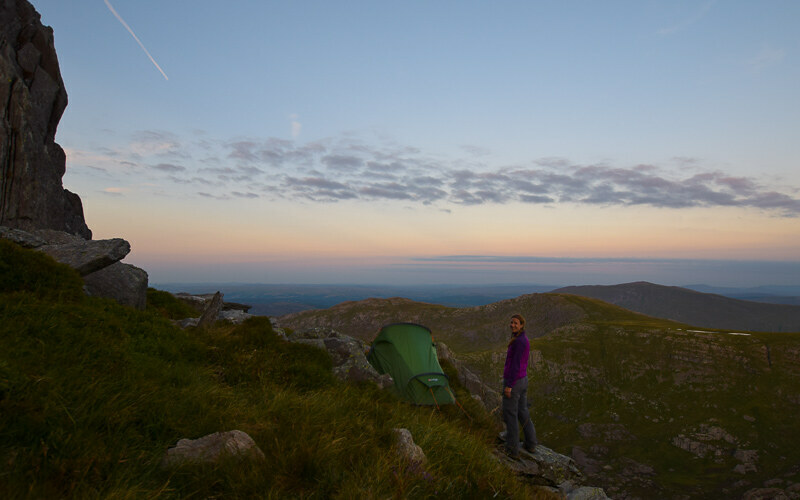 Wild camping is becoming ever popular in the UK, with a love for mini adventures and exploring the outdoors. If you follow avid hikers and adventurers on Instagram you’ll see them wild camping in the Peak District, Lake District or even Snowdonia. But if you haven’t ‘wild camped’ before then you might have a few questions. Firstly, this isn’t going to tell you about all the best wild camping locations in the UK. Why? Because if I did everyone who reads this would go and make a beautiful remote wild camping spot into a campsite. No-one who wild camps would want that. If you are looking for a social camping experience then simply book yourself in at a campsite. But are you still wondering if wild camping in the UK is for you? Here is my beginner’s guide to all you need to know on the ‘wild camping essentials’ in the UK. From top tips to finding the best wild camping spot when you hike to what essential wild camping equipment, you need and even going for a wild wee! Where can you wild camp in the UK? When to pitch your wild camping spot? How safe is wild camping in the UK? What to take wild camping? What food do you take wild camping? How to cook in the wild? What do you do with your rubbish? Where to go to the toilet? Where can you wild camp in the UK + Tips? In Scotland, it is legal to wild camp, with a few exceptions in Loch Lomond and the Trossachs National Park. 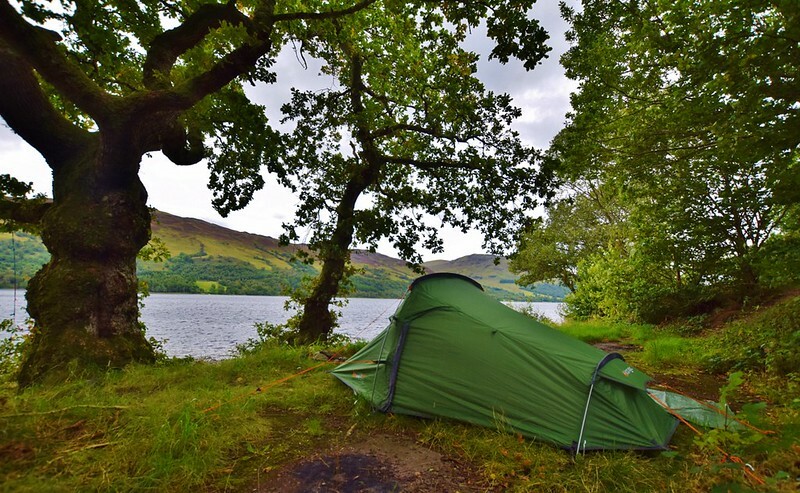 I camped by a lake in Loch Lomond last year, it’s wild camping but in an official permit area where you have to register and pay for the spot. You’re still wild camping but this helps to protect the popular spots in the parks. In England and Wales, except for some areas on Dartmoor, most of the land is privately owned so you’ll need to ask permission from the landowner. Saying that it’s not always that easy to find out who owns the land but if you spot a local farmer whilst out you can ask them. The key is that you are respectful of the land and the people that own it. Whether you’re camping or hiking through it remember to leave no trace. Remember you could be asked to be moved on at any time. Don’t pitch your tent next to the path or even worse next to a car park (again think ‘wild’ camping). Don’t trample or cut down any plants or trees to make a good spot. Respect nature. The best advice here is to arrive late and leave early. Imagine going for a peaceful hike and being met with tents and bivvy bags along the way. 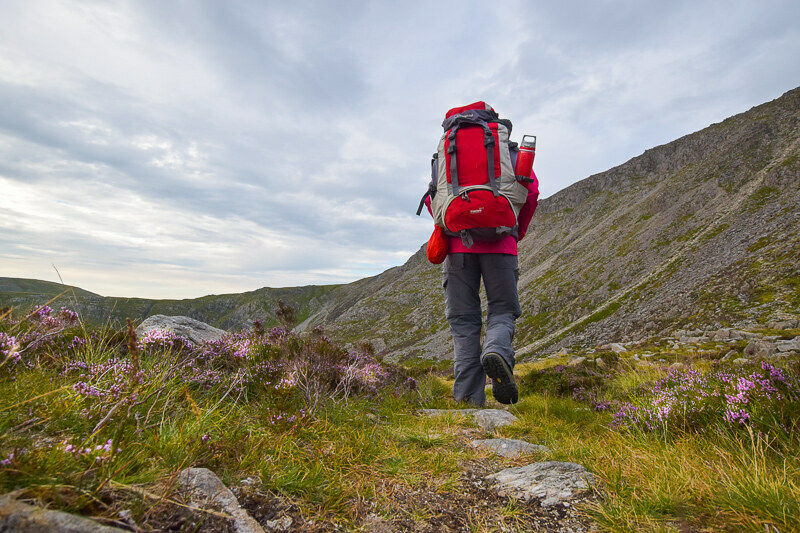 In order to reduce the impact on wildlife and fellow hikers be considerate and plan your wild camping arrival and departure when it will least impact them all. Ideally, you want to arrive within an hour of the sun going down, so you can see to put your tent up. Depending on the time of year in winter (if you’re brave enough) this could be arriving at 5 pm or in summer months much later around 8.30 pm. As a solo hiker and wild camper, I get asked this question a lot. Aren’t you scared when you wild camp on your own? Are you worried something might happen? Firstly, if you’re worried about wild camping solo then asked a friend to join your first time. There’s a definite comfort in numbers. My first wild camping trip was with my sister. I honestly feel totally safe when I wild camp, mostly because I try to find a well-hidden camping spot so no-one would ever spot me in the first place. For me, it feels safer than a night out in my local city Nottingham with hundreds of people about! Camping Essentials – What to take wild camping? Whatever you’re planning on taking, firstly remember you’re going to be carrying it all, up and down to your camping spot. Ideally, the less weight you can take the better, essentials only. Extra warm clothes, including a hat and gloves, it can get cool at night. Food and water, depending on what you’re eating you might need cooking equipment, plus gas. Consider whether there is a water supply on the route, an essential item and factor in how much water you might need for the evening and morning hike as well. Pack your warm clothes and important gear in dry bags so they don’t get wet if it rains! You can read about my beginners guide to camping here. However this is aimed at camping in campsites in the UK, not wild camping so please don’t pack everything on the list because you won’t be able to carry it! Camping Essentials – What food do you take wild camping? Camping can get a bad reputation for awful food but you can get some great camping food. Summit to Eat freeze-dried meals have some great meal options. Although the breakfast and dessert options weren’t to my taste the main meals were great. You can read more about which flavours I tried here – Summit to Eat review. Other dinner options, a tin of tuna (buy the easy pull option), couscous and salad is a great summer meal. On cooler evenings, pasta and pesto or chunky soup with a big hunk of bread is a great option. Firstly, decide whether you need to cook, in summer you can get away with cold food. Although I do love a mug of peppermint tea before bed when I’m wild camping. Plus a coffee is essential to get me going in the morning. I have a small but simple gas cooking attachment which you can simply attach to any size gas canister (smaller are better as they are lighter of course!) Make sure you find a flat space, away from any grass or plants. Use a flat (ish) rock if necessary to raise from the ground. What about lighting a fire whilst wild camping? I know people do this but before you consider making a fire, really think about whether it’s the right decision. Has it rained in the last 10 days? If not, then the ground is very dry which could cause a forest fire. Do you have enough dry firewood? Can you put the fire out quickly if it got out of hand? If in doubt then don’t light it! 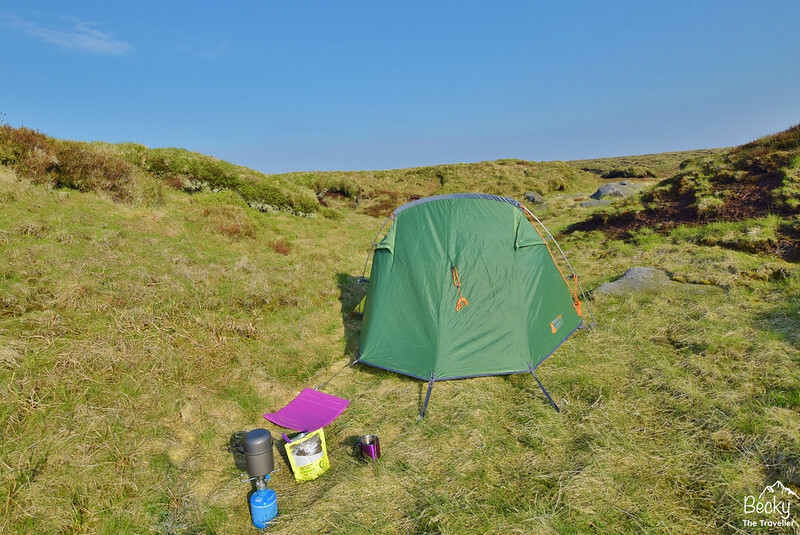 Wild Camping tips – What do you do with your rubbish? Maybe pop it in a bag, leave it on a tree for the refuse collector? Nope, wrong answer! There’s only one right answer here, pack everything up, yes those mouldy bananas, empty packets of crisps, toilet paper and take it ALL home. Even if the local car parks have bins I’d still recommend taking your rubbish home with you. In busy periods, small car parks might not be able to cope with the amount of rubbish and result in pieces escaping from the bin. Wild Camping tips – Where to go to the toilet? Wild camping comes with it’s less glamorous factors, including going to the toilet. Where do you go to the toilet when you are wild camping? No. 1s (aka a wee) – If you need a little wee, then the key thing to remember is to go at least 30 m from any water source. Ideally, behind a tree, big rock or wall to hide from anyone else walking by, it’s more tricky for us ladies! No. 2s (aka a poo) – This is a little more complicated. I feel my body knows when I’m wild camping and generally waits but I have had a couple of occasions when I’ve really need to go. So what do you do? Firstly, try and find a discreet spot (if you can) hopefully there aren’t too many people about. Then with a stick, walking pole or trowel (if you found space to pack one) dig a hole. This is known as nature’s toilet, be respectful and dig a decent way down. Do your business and refill. Simple! What about the toilet paper? – I favour the shake method when I go for a wee, this means no need to carry tissues that you’ve used. If you’d rather use a tissue and you probably will if you go for a poo, make sure you pack a small bag to carry them away (Dog poo bags are a perfect size!). Do NOT leave them behind, this is truly disgusting and no-one wants to see your used tissues! Another option is burning them, but think before you do this (read about lighting a fire whilst wild camping above) as the results could be very dangerous if the fire wasn’t put out properly, you can see the damage done in the Peak District on Saddleworth Moor from fires, which is terribly sad. Leave no trace – pack everything in your bag! In the morning, the sun is a great wake up call and the reason you’re probably out camping in the first place. The light shining through the thin canvas or simply directly on you if you’re in a bivvy bag. Top Tip – Try to get up early, before fellow hikers are on the trail. Enjoy a peaceful and relaxing start to the day, with a cup of coffee and breakfast to wake up. Remember you’re not on a campsite, you can’t simply leave your tent set up for the following night! Do a final scan of the area to make sure you’ve not left anything, small pieces of rubbish, tent pegs or food. Of course, when wild camping, the simple way to remember is – Leave No Trace. Do you have any more questions about wild camping essentials or tips? Would you like to try wild camping in the UK? Feel free to ask me any questions in the comments below.